The mountains, especially the Alps and the Pyrenees, that's where the Tour de France is won or lost. It's there that champions are made and where at times some of the toughest are defeated. It's where men like Christophe, Coppi, Bahamontes, Merckx, and Armstrong have shown their mettle. And it it's not on the way up where the battle is decided, it may be on the way down, where speeds of 70 miles per hour are reached and a reaction speeds and bike handling can be decisive. This beautifully illustrated book looks at the battlefields and at the men who've fought there throughout the history of the Tour. With over 100 duotone photographs, it's not only a great record of the history of the Tour, but also a fine gift for anyone interested in bicycle racing. Richard Yates was born in London in 1938. He caught the cycling bug in 1953, when he was inspired by reports of Bobet’s Tour de France victory. He moved to France in 1992, and it was only then that he came to realize how well bicycle racing on the road lends itself to the written form. He first became a collector of cycling books and magazines, then started writing articles for cycling periodicals in Britain, followed by eight book translation projects, and finally his own book on Jacques Anquetil, and now this book on the mountains of the Tour. Eugene Christophe on the Galibier in 1912, on his way to winning the 5th stage at Grenoble. 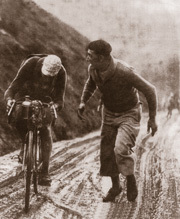 Andre Leduc on the Aubisque in 1932, being encouraged by Antonin Magne, the previous year's winner. Yes, that's snow you see there--it was one of the coldest rides in Tour history. 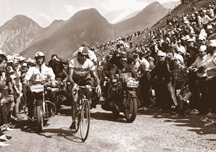 Bahamontes on the Tourmalet in 1964, at age 37. Despite winning the major mountain stages, he finished third overall, mainly due to his poor time trialing performance.